On Sunday we were watching Conference and Pey let go of the couch and took two steps before face planting. She has been doing it ever since. I am very exciting for her to walk, but at the same time I know I will be chasing her everywhere! Now she is letting go and taking 3 steps then the face plant or she has learned to slowly sit down. She will let go of what ever she is holding and just stand frozen for a good 10 seconds. * She loves to hold on to the couch and walk all the way around the room. Dad loves to let her hold on to his fingers and walk around the house. * Her vocab is more than just baba dada and mama. She says Hi and Sit. Yup I was yelling at the dog the other day to sit and she said it clear as day. I got it on video, I should probably post it. *She dropped her bottle behind the couch and said UH OH! I've been trying to teach her that for a while and now she says it all the time. * One of my most favorite things she does is if she eats something she likes she says mmmm. Cheese, Ice cream and Applesauce (homemade) are her favorite. * She shakes her head NO and smiles because she things she being funny. *She loves lifting up her shirt and covering her face with it, she is playing peek a boo. * She has been upgraded from a carrier to a car seat, and from a Mazda to an Xterra!! I think she likes being able to see out and not having her legs smashed into the back of the seat. * I can ask her where her baba is or where Kilo is and she will go to it/him. * Peys personality is really shining through. She is always so happy and just wants you to play with her on the floor. Like I said earlier with "NO", she is going to be a little stinker. If I go to pick her up she trys crawling away. * Still size 3 diapers I think they are finally starting to fit right. Her legs are so little, but she is just so long. * Her clothes sizes are about 9-18 months I just have to try everything on her. She was playing with a 17 month old and was just about as tall as her. *Still my long skinny baby! *Pey likes to copy you, if Kilo barks she tries. When Mike sings or makes noises she tries to it's pretty darn cute. *It's safe to say she had her first taste of Dr. Pepper. I had a little left over and it was watered down. She was screaming in the back of Paydens car and that's all I had and it worked for a little bit. * She is still just so happy and very talkative. 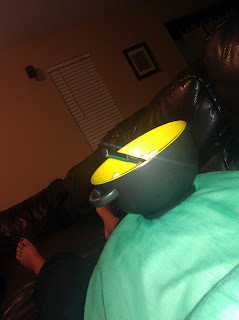 She still lets you know when she is hungry its quite the ordeal. * Pey still signs more, but sometimes she claps. They look pretty much the same. * Peyton went to Disneyland for the 1st time! 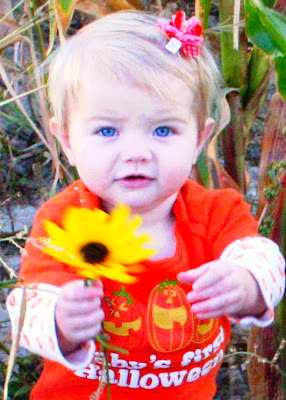 * Peyton went to the Pumpkin Patch and had her first Halloween Party! her hair is getting long!!! she is super cute! She's so cute. 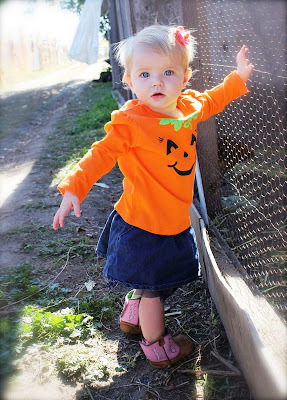 I love those darling cowboy boots! How fun that she's so close to walking. ahhhh! i love her! she's so cute nikki!! !